I just decorated a Christmas tree for the first time in years and it was a amazing to pull out ornaments I forgot I had. Personally, I've never been interested in those colour-coordinated Christmas trees, with carefully chosen sparkling balls that match the perfectly hung garland or ribbon. They look nice, but they have no feeling. I like a tree with a jumble of colours, shapes, and sizes, where each ornament tells a story. As my brother and I were growing up, our mom bought us each an ornament every year, so by the time we moved out we had quite the collection. One year I made ornaments for my family as gifts and I was hooked. The joy of making something pretty to hang on the tree, plus the fact that I've spent most of my adult life on a tight budget and can't splurge on decorations, means you'll often find me pulling out the glue gun at this time of year to make a new decoration or two. 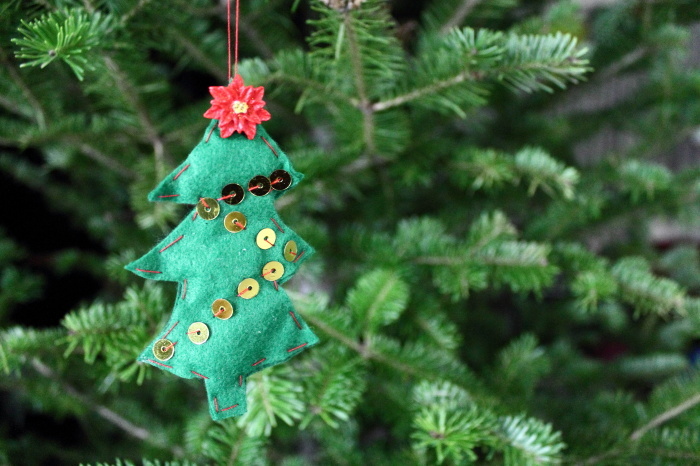 Do you prefer the handmade look on your tree? Are you trying to save money around the holidays? Here are my suggestions for making your own ornaments. Give it a try! I hope you have as much fun as I do. One of my newest Christmas traditions has quickly become my favourite: hosting Christmas Ornament making parties. This year the turnout was pretty incredible (we invited a ton of people thinking only a handful would come - and we were wrong!) and I loved watching the creativity explode all over my living room. Everyone brought snacks and bounced ideas off each other. I swear the creativity factor goes up when you fill the room with good people and good food. There are so many things you can make ornaments out of. When I was a kid we cut circles out of cardboard and glued dried beans to them. To start, you'll need some sort of base for the ornament. This year I bought a ton of Styrofoam balls from the dollarstore and a few glass balls and blank ceramic ornaments from Michaels. One of the guests brought a huge bag of pine cones and those went over really well too. You can use just about anything to decorate them with. Burlap was popular last year, this year people were more into glitter paint. We also had: old sheet music, plastic berries, little bells, googly eyes, fabric, tissue paper, tiny pom-poms, thin cardboard, felt, feathers, small adornments like snowflakes, poinsettias, gingerbread men, cinnamon sticks, ribbons, old gold doilies (also used for decoration at my Dirty 30s birthday party) and whatever else I could find in my bottomless craft drawers or at the dollarstore. Paint, white glue, and a glue gun are also a must. Thankfully, most of these supplies are pretty cheap so getting crafty doesn't have to cost a lot! You could spend days looking at ornaments on Pinterest. Each year I pin a few new ones and choose one or two that I want to try. Last year I wanted to make a mouse, this year was all about a pine cone hedgehog. If you can find a tutorial you like that's great, but if not just wing it. Our hedgehogs didn't turn out like the picture but they're still pretty cute! You could also browse professionally made ornaments to see if they give you ideas. Just don't get down on yourself if they don't turn out looking the same. The fun is in the process and if you don't like the results, start over! After I've finished the piece I've been meaning to try, I usually start looking around the table (chaotic and messy as it usually is by this point) and grab whatever catches my eye - a blank ceramic piece, some silver leaf.... I let the object tell me what it wants to be and go from there. The results can go either way - sometimes I make something adorable, and sometimes it turns out terrible. But the act of reaching into the pile and putting pieces together, that's where the magic happens. A lot of people come to my ornament parties with no ideas, convinced that they don't know what to do, but an hour or so playing around with materials usually gets them smiling, whether they've made something beautiful, goofy, or totally experimental. Try it!